Although I will try to avoid going deep into technical details, it is hard to keep this section short. It more less started at a workshop in The Other Music Academy, and because of that a master thesis about Present Time Composition, a method for free improvisation developed by my teacher Alan Bern. In this first phase, my research lead me to investigate something called embodied cognition. Because of that topic, I got hired to do a research project in the University of Leuven (Begium), which allowed me to really delve deep into the role of the body in experiencing and learning music. And in turn, out of that came a research project in the conservatory of Antwerp (Belgium), where I am trying to put everything I learned into practice by teaching a group of classical music students to improvise with Present Time Composition. In the process of the research, I have had the opportunity to teach a number of workshops and courses on Present Time Composition in relatively fancy places, which is why I’ll proudly mention some here: there was one in Weimar for a group of musicians accompanying a theatre group in a project called WaldSinnPhonie, and I also taught PTC in METRIC, an EU-funded project bringing together students and teachers from conservatories all over Europe to exchange expertise on the ways in which improvisation can be a tool in classical music education. There, I’ll stop throwing references now. So what is PTC? The general idea behind it is that composition is not necessarily a cerebral thing, but that it should be possible for a group of musicians to intentionally create complex and “compositional” structure in the moment in a process of recognition and negotiation. It basically assumes that the process of creating meaning in music (musical semantics, that is) is elaborate enough to allow musicians to communicate with one another about where they are going and to create the piece in the moment on that basis. Furthermore, PTC assumes that actually, throughout most of music history, this was standard practice for most musicians, and that it is almost exclusively in Western music in the last century or so that thinking about music as spontaneous creation and communication in the moment has had to make room for the image of a genius composer sitting alone at his desk to write his masterpieces. 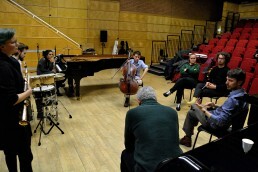 And so one of the main goals of PTC is to get students and musicians to experience music not as notes that are fixed on a score because they have been written by a composer whose authority is not to be questioned, but to experience it as a fluid process of meaning making and communication with oneself and other musicians, and the audience. And as if that weren’t enough, to top it all of PTC says that training to make music like this (because it IS training, like a sports team) will help musicians understand music in a different and richer way and also play it in a different and richer way. And so all of these things I have been reading and writing about, going through scientific evidence that supports these assumptions. It’s not an easy task, but extremely satisfying. I know that all of this is highly abstract and maybe it sounds a little strange. So if you’re interested, be sure to contact me or Alan about it because we’re always very happy to spread the word!